Consumers are always interested in getting value for money and fresh herbs deliver great returns on little investment. Not only do small potted herb plants look well and add charm to a kitchen or other area, but tending to them encourages a new hobby and ultimately they can be useful in cookery and decoration. Many florists sell herbs ready to be tended in their own containers. Often these little kits include instructions on care and tending, but it never hurts for florists to offer further information on containers, soil, watering, and uses for particular fresh herbs. 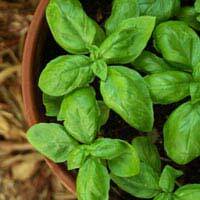 Growing fresh herbs in containers have many advantages. Not only can the containers be moved around (into sunshine, out of heat the heat, etc) but containers allow herbs to be grown indoors so even those whose homes have no garden can enjoy this activity. Containers also allow for a variety of different herbs to be grown together, but without fear of any plants encroaching on the others. This is particularly true of keeping weeds away from herbs. Herbs grown in containers can be sunk into the ground as well, so they really are very versatile. The most important aspects of containers for growing herbs is that they be big enough to accommodate the grown plants, and that they have adequate drainage because the soil in them will be watered directly. When growing fresh herbs in containers do not bring in soil from the back garden. This soil may have bacteria, weed seeds and other items harmful to a growing herb plant. Instead, use a soil mix which has been developed for container gardening. Some slight fertilisation may be helpful for container-grown herbs, and covering soil with moss or another version of mulch could help plants grow as well. Adding a polymer to the soil could also help cut down on the number of times per week the containers must be watered as more moisture will be retained in the soil for plant use. Herbs grown in containers need at least an inch of water per week. Ideally soiled should be checked every day to see if it is at an acceptable level of moistness. It is very important that the drains in the container are not blocked as water will need to flow out of them during watering. If water escapes the drain holes it means that the soil is saturated. Clearing the drain holes every so often will help ensure proper drainage. Keeping the containers slightly elevated, such as on cooling racks, will also help guard against drain blocks and compacted soil at the bottom of the container. Fresh herbs can be harvested and added to recipes to help enhance flavour, but they can also be dried in a microwave, oven or food dehydrator for use in the future. Herbs can also be dried in salt, and this new flavoured mixture added to dishes. In addition to using dried herbs for cookery, they can also be used for decoration such as in potpourri mixes to perfume the air or in decorative wreaths along with flowers. Herbs dried upright on a stalk could also be added to bouquets of dried flowers for another decorative touch. Herb pots make a great addition to any florist's stock. Adding extra instructions on containers, soil, watering and uses for fresh herbs will help customers feel more confident in their new activity as well as appreciative of the great return they will get on this small investment. Are You a Good Fit for Floristry? @Lolo - Yes, they are a bloom known for wilting instantly. If you look at the stem of your hydrangea there is a substance that usually coats the bottom and doesn't let moisture through. As they are the only flower that drinks through their blooms, they like a lot of fresh water - so it important that the stem is not clogged. Cut a long diagonal piece through the base of the stem exposing the pith, which should let the water through. There are people that will recommend all sorts of methods such as plunging the stems in icy water, but a packet of flower food should help extend bloom life.